Scholarships and bursaries for 2019 entry are now open and will close on Monday 5 February 2018. Clayfield College’s Scholarship Program celebrates and fosters excellence. It also recognises students who take responsibility for, and are proactive in, the development of their own education. Importantly, the program provides opportunities for students to attend Clayfield College who may not otherwise be able to do so. In 2019, the College is pleased to offer Excellence Scholarships (Academic, STEM, Sport and Leadership), as well as an Isolated Children’s Parents’ Association (ICPA) Bursary. A limited number of scholarships will be awarded and are reviewed at each Semester reporting period. Excellence in Academics, Sport and STEM Scholarships provide partial remission of tuition fees at the discretion of the Principal, with Excellence in Leadership Scholarships covering 25% of tuition fees for Years 7 to 12. The value of the ICPA Bursary is also at the discretion of the Principal. For further information in relation to the College’s scholarship and bursary opportunities, please contact the Director of Enrolments and Marketing on 3262 0220 or enrol@clayfield.qld.edu.au. Academic Scholarships are available to students entering Year 7 or Year 11 in 2019. All applicants are required to sit the ACER Academic Scholarship Exam to be held on Saturday 24 February 2018. Applicants are also required to submit an application form, covering letter, personal résumé, copies of two most recent school reports and NAPLAN results. Shortlisted applicants will be invited to attend an interview. To register for the ACER Exam, please click here. To apply for a 2019 Excellence in Academics Scholarship, please click here to complete the application form. If you wish to be considered for an Excellence in Academics Scholarship in other Secondary year levels, please contact the Director of Enrolments and Marketing on 3262 0220 or enrol@clayfield.qld.edu.au to discuss. A limited number of Science, Technology, Engineering, Maths (STEM) Scholarships are available to students entering in Years 9, 10 and 11 in 2019. In offering such scholarships, the College seeks to support students who have demonstrated outstanding academic aptitude and are committed to continuing their pursuit of academia beyond Secondary schooling. To be considered for this scholarship, applicants must be strong A-grade students across two of the following three subjects – Science, Technology, Mathematics, and therefore, be in the top 5% of their cohort. There is also an expectation that applicants will be striving to achieve a minimum ATAR of 97 at the end of Year 12 under the new QCE System to be introduced in 2019. All applicants are required to sit the ACER Academic Scholarship Exam to be held on Saturday 24 February 2018. Applicants are also required to submit an application form, covering letter, personal résumé, copies of two most recent school reports and NAPLAN results. Shortlisted applicants will be invited to attend an interview. To apply for a 2019 Excellence in STEM Scholarship, please click here to complete the application form. Sport Scholarships are available to students entering Years 7 to 11 in 2019 who can demonstrate outstanding excellence in sport such as selection in State or National teams. High achievement in academic results is also an essential criteria of this scholarship and all applicants are required to sit the ACER Academic Scholarship Exam to be held on Saturday 24 February 2018. To apply for an Excellence in Sport Scholarship, students must submit an application form, covering letter, personal résumé, copies of two most recent school reports and NAPLAN results, as well as a reference from a current coach. Shortlisted applicants will be invited to attend an interview with the Principal. To apply for a 2019 Excellence in Sport Scholarship, please click here to complete the application form. 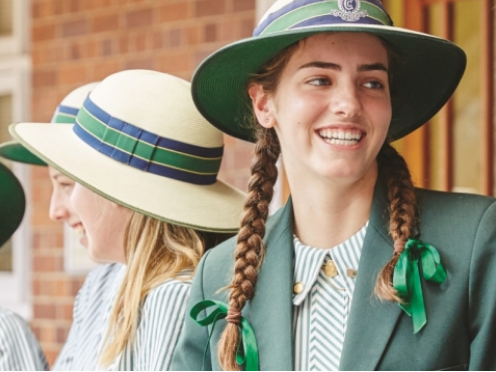 Clayfield College is proud to offer a Scholarship Program to young leaders, that is, students who are current Year 6 School Captains or Vice Captains for Year 7 entry. These scholarships are available to students who have demonstrated excellence through leadership, and are dedicated to being actively involved within the College community. Students must demonstrate a commitment to College life by being diligent in their academic studies, and also through their willingness to participate in the College’s Co-curricular Program. To apply, students must submit an application form, covering letter, personal résumé (including supporting evidence of leadership duties), and copies of two most recent school reports and Year 5 NAPLAN results. Shortlisted applicants will be invited to attend an interview with the Dean of Pastoral Care. Please click here to apply for a 2018 Excellence in Leadership Scholarship. The ICPA Bursary is awarded to a student entering Year 7 who lives in a remote or isolated region and needs to live away from home to complete her schooling. The applicant must be a daughter of an ICPA member. To apply for an ICPA Bursary, an application form must be submitted with a covering letter, personal résumé, copies of two most recent school reports and latest NAPLAN results, and a character reference from the Principal of the applicant’s current school. Suitable applicants will be invited to attend an interview with the Principal. To apply for an ICPA Bursary in 2019, please click here to complete the application form. In order to retain a scholarship at Clayfield College, students are expected to maintain high standards in their conduct and academic results throughout the scholarship period, and to actively participate and embrace College life. In accepting a scholarship, parents/guardians agree that they understand their child will complete their education at Clayfield College. The College reserves the right to request the full repayment of the total value of the scholarship if students/parents do not fulfil this expectation without valid cause. Level 6, Suite 3, 138 Albert St.